Egypt's Interim Leader May Tap Emergency Law Used By Mubarak : The Two-Way Adly Mansour has issued a decree that also sets a timetable for new elections. Some analysts believe his decisions will only embolden Islamists. Others say the short timetable to elections should encourage Egyptians and others that the country is moving to restore civilian rule. Egypt's military and the nation's interim leaders say the ouster of President Mohammed Morsi was not a coup, but rather a response to public demand. Morsi's supporters believe otherwise. 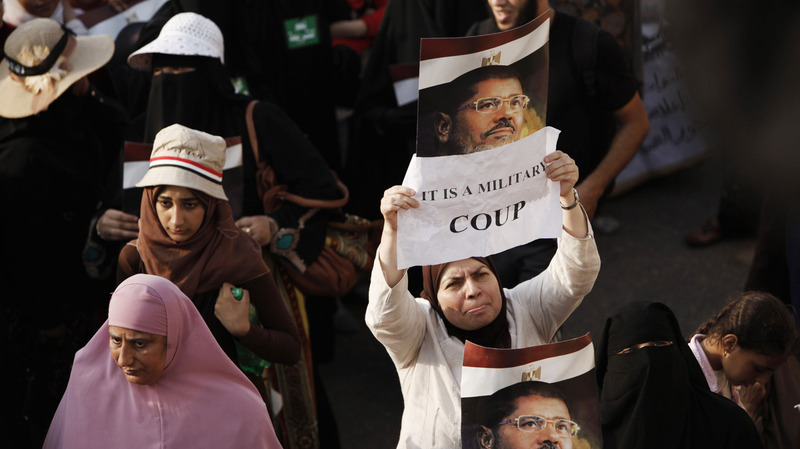 If it was judged to be a coup, the U.S. might have to cut off aid to Egypt's military. With the news still echoing across Egypt that more than 50 people were killed during a protest over the ouster of President Mohammed Morsi, the country's interim leader issued a decree late Monday that gives himself sweeping powers until new elections are held. The order "effectively makes the military-appointed president, Adly Mansour, all powerful," NPR Cairo bureau chief Leila Fadel tells our Newscast Desk. "He holds legislative and executive powers until a parliament is elected. And he has the right to declare a state of emergency for three months in consultation with a still unappointed Cabinet." As NPR's Soraya Sarhaddi Nelson notes on Morning Edition, "the state-of-emergency law was one deposed leader Hosni Mubarak used for decades to shore up his autocratic rule." If it's imposed, that would mean the Egyptian military, which removed the democratically elected Morsi from office and put Mansour in his place, "could more easily clamp down on the coup opponents without having to legally answer for it." Mansour's decree said amendments to Egypt's suspended constitution could be voted on within the next 4 1/2 months. That vote could then be followed by parliamentary elections. The vote for a new president could come early next year. Shadi Hamid, director of research at the Brookings Institution's Doha Research Center, tells Soraya that Morsi's ouster, the deaths of his supporters at Monday's protest and the new decree from Mansour may serve only to embolden Islamists in Egypt who want Morsi returned to office and his Muslim Brotherhood colleagues back in key posts. "You have these radicals who are now making the case that democracy doesn't work and that violence is the only way forward," Hamid says. "Seeking to reassure Egyptians and the world about its intention to return to civilian democracy, the military-led interim government on Tuesday laid out a brisk timetable to overhaul Egypt's suspended Constitution, elect a new Parliament and choose a new president, all in the space of about six months. "The release of the new timetable, issued in the name of the interim president, Adli Mansour, appeared intended to show steps toward civilian democracy after the military's mass shooting of more than 50 Islamist protesters on Monday raised new doubts about the democratic promises of the generals who ousted former President Mohamed Morsi last week." Note: As sometimes happens with reports from overseas, news organizations aren't in agreement about how to spell Mansour's name.